In order to practice as a yoga therapist in a manner that exemplifies the intelligence and elegant simplicity of the original teachings, intensive practical training is necessary. There is a need for the development of skills in observation, assessment, course design and progression, yogic anatomy, physiology, and psychology, as well western pathology and the therapeutic yogic approach to the various conditions and ailments affecting the different systems of the body. All of these tools are essential to ensure that each personal practice designed is truly appropriate for the person concerned. PLEASE NOTE: Dr NC has recently advised that he will be focussing on writing for now. This means that he is unable to attend Australia bi-annually. As a reasult we are reviewing our therapist training. Please ensure you let us know of your interest and we will update you as new plans and programs are setttled. Meanwhile do consider joining our Ayurveda in Yoga program in India 2 – 12 September wtih Saraswathi Vasudevan and Dr Abilash. A boon to all practitioners teachers, and therapists. The Post Graduate Diploma in Yoga Therapy (PGDYT) is an authentic, comprehensive, very carefully structured and practical three year training program satisfying international standards and accredited by the Australian Association of Yoga Therapists (AAYT). It combines the ancient teachings of yoga with western medical knowledge. The program is offered in conjunction with the Vaidya Sala and is directed by Dr N. Chandrasekaran MBBS (Dr NC), world authority on yoga therapy, international teacher and author. 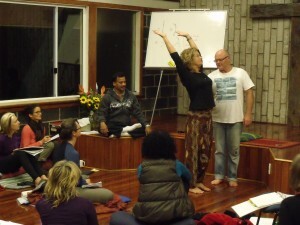 The PGDYT course content is based on the ancient teachings as revived by T Krisnamacharya, (teacher of TKV Desikachar, BKS Iyengar, Pattabhi Jois and Indra Devi) combined with the extensive experience of Dr NC as past Director of Therapy at the Krishnamacharya Yoga Mandiram (KYM) and as a practising medical doctor for over thirty years. The program is offered over three years and consists of six 9 day intensive modules held around May and November each year in Australia, as well as a two week (minimum) practical internship under the direction of Dr NC in Chennai, India. The PGDYT program is unique in Australia, incorporating over 50 live case studies during the course of the training, as well as by its inclusion of the internship with the VHF. The PGDYT program format is similar to a medical training with mornings spent on theory and practical workshops each afternoon. The PGDYT is open to those who are qualified as level Yoga Australia Level one yoga teachers (or equivalent) who have been teaching for at least one year (with 150+ hours of experience) and who have completed the Foundations of Viniyoga: a Therapeutic Approach. The Post Grad Dip Yoga Therapy (YTA) is accredited by Australian Association of Yoga Therapists (AAYT) and Yoga Australia and thus readily satisfies international standards. Graduates of the PGDYT (YTA) who are actively involved in the practice of yoga therapy, will be deemed to meet the membership standards. Pathology and therapeutic yoga approach to different conditions and ailments including conditions relating to the muscular-skeleto, digestive, respiratory, cardio-vascular, nervous, endocrine, reproductive (including pre and post natal care), urinary, and lymphatic systems, mental emotional conditions, cancer, autoimmune conditions, eating disorders, addictions and geriatric care. Extensive discussion of some of the important ailments and diseases as perceived by the allopathic system with respect to pathology, the effect on the individual, assessment of the effect of the ailment on the individual, what to do and not to do as a yoga therapist, simple diet and other lifestyle modifications as suited to each condition. Over 50 people will be presented as live case studies. Each is observed, assessed, prescribed and taught an appropriate practice, and subsequently discussed. Practical internship with Dr NC in Chennai, India. This may be taken at any time after completion of the third module. Four of the six modules are generally residential with two are offered day attendance only, are are conducted in a major city. The course cost varies as it depends on the venue for each module as well as your accommodation choice. The current costs for residential sessions range from around $2295 to around $3200 for a private room or cabin, depending on venue. The prices shown for the current residential trainings are highly indicative and include all tuition, ayurvedic organic vegetarian food and accommodation. For day attendance sessions the cost is around $1800 per Module, (tuition only). The internship is currently $900 tuition only. Every effort is made to keep our costs down and the teachings accessible.